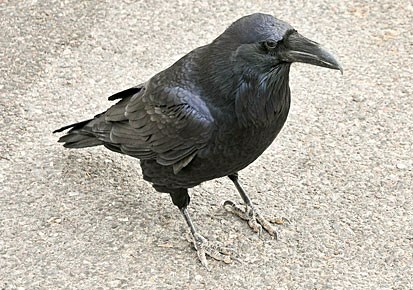 The raven is a large, imposing black bird with a heavy black bill and dark feet. It is quite distinct: the only similar species in the region is the northwestern crow. Details on the differences between the two species can be found below. The common raven thrives in numerous habitats, from rural open fields to forests, mountains, deserts, and coastal areas. It is not generally found in urban habitats, unlike the American or northwestern crow. The common raven is found year-round across Canada, except in the southern Prairie Provinces, and ranges south through the western United States. 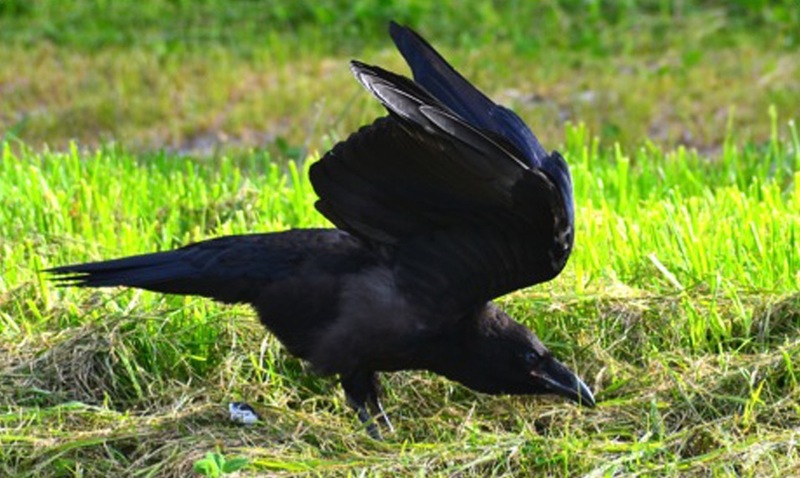 The common raven can sometimes be mistaken for the American or northwestern crow (Corvus caurinus), and only the latter is found on the BC coast. 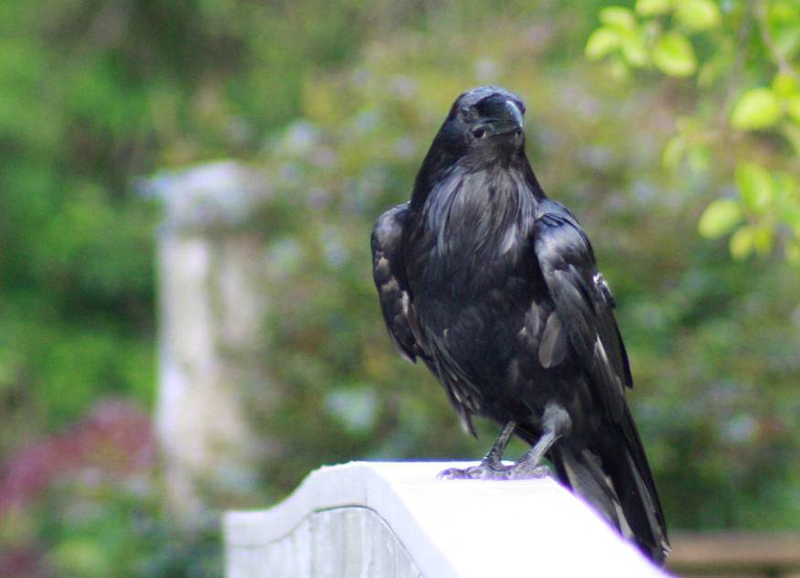 The raven is much larger with a noticeably larger bill, it has a wedge-shaped tail (instead of the crows' rounded fan-shaped tail) and it often has shaggy feathers on its throat and forehead. The common raven can be up to 61 cm long, while the crow is only 40-45 cm long, from bill to tail. The raven is an essential player in the mythology of First Nations in the Pacific Northwest, where it is variously known as the Creator, Trickster, and as a Cheater. In a Haida legend, Raven created the Haida people by finding them in a clamshell and convincing them to come out and share his world. A sculpture of this story is on display the the Museum of Anthropology at the University of British Columbia. A Tlingit story tells of how Raven brought light to the world, which is another theme in mythology about the Raven. A video of one telling of the story can be viewed here. Common Raven. Corvus corvax. The Birds of North America Online (A. Poole, Ed.). Ithaca: Cornell Lab of Ornithology; Retrieved from the Birds of North America Online. Accessed 19/02/2013. Dunn, J. L. and Alderfer, J. (Eds.). (2006). National Geographic Field Guide to the Birds of North America. (5th Ed.). Washington, D.C.: National Geographic Society. Pp. 326-327.